Wow, making that matchbox museum piece seems so far away and the intervening months have been crazy. Just after my Dad’s 79th birthday, I received a call from their English neighbour to say Dad had a stroke. 2 days later I was in France and my life was basically put on hold for 3 months. Ever since I returned from France I felt unsettled and unfocused. I can’t even remember what I was doing before going to France as it seems like a life time ago. I did intend to paint and draw while I was in Brittany as it is a wonderful place full of rivers, amazing architecture and woods, all the things I would love to be surrounded by in Texas. However, sorting out my parents and their affairs just drain me completely. I did take a lot of photos at the end of the trip when my husband came for 10 days and I do have an idea fermenting but at the moment artistically I feel spent. I actually took a bunch of photos specifically with that idea in mind. Once I am back up to speed I am sure that idea will become reality. This is the one sketch I managed to do while I was away. These stone crucifixes dot the countryside of Brittany (not sure if it is just a Breton tradition) which marks the way to the local Temple (church). 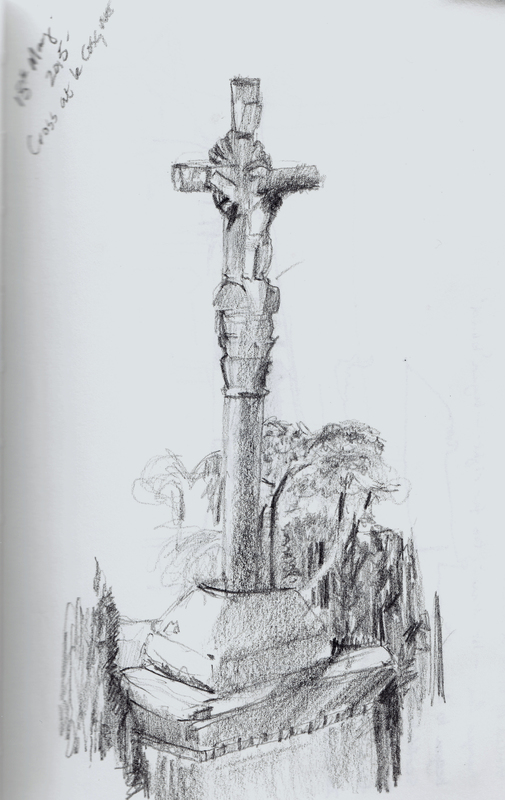 I have always been fascinated by these crosses and this one is at the bottom of the road that leads to the hamlet where my parents lived, It was always a welcome sight at end of a long journey. So it was fitting this was the only drawing I managed (I made few other aborted drawings at other places) as this was the last trip I would be making to this part of France. As I have said, I have not felt settled since coming back, mainly due to the fact there are still several loose ends to tie up in France. Anyway yesterday, I decided I had enough of this moping around waiting for things to happen, life is too precious. I made the decision to move my table away from a wall to facing a window. I figured all my energy was being sapped by the blank wall in front of me. Next step was to actually do something. For that I got inspiration from my friend Heather who writes a couple of blogs about drawing. Her latest challenge is found on 805 steps where she has chosen to document a very small part of the Hertford Union Canal, starting at Wick lane and ending at White post Lane in London. The drawings are amazing. 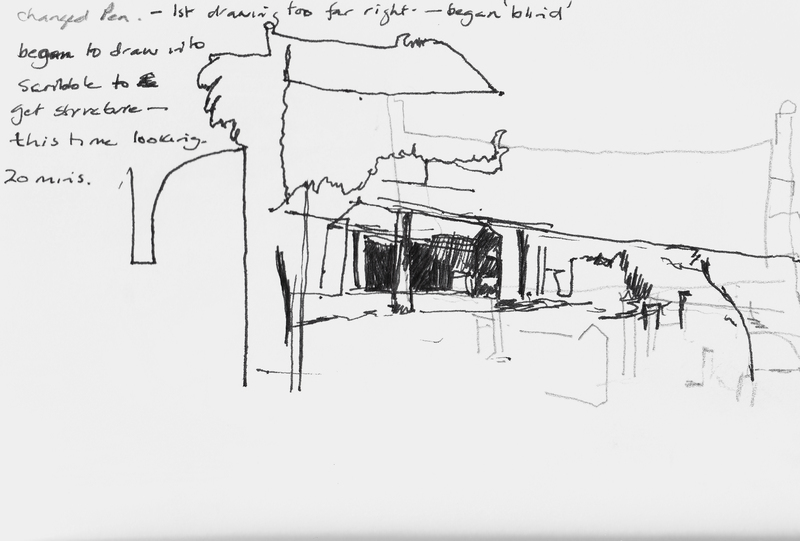 So this morning I took a short walk to Pfluger Park in Pflugerville and did a very brief sketch. One thing I always have problems with when working outside is deciphering what I am seeing as my eyes are darting all over the place. I am not comfortable drawing most of the time and drawing outside is probably my least favourite thing to do. In my still life set ups I have complete control over what I see, with a landscape everything is out of my control and comfort zone. I began by not worrying about drawing accurately by drawing ‘blind’ without looking at my paper. I have done this before sketching in my living room and back garden, it’s very freeing if you are worried about your ability to draw. As you can probably see from my notes on the sketch, I started off in pencil (B7) and then moved on a fine line pen. Towards the end I actually looked at the drawing and started to draw in the structure. The important thing to me wasn’t the actual view but the process of drawing and looking. So the fact it ended up not looking anything more than a scribble really didn’t bother me. Not sure anyone looking at this drawing would make out much but I know when I come to look at it in future, I will understand it and its shorthand. I am not very good at keeping up on projects so I don’t know how much this will evolve but I am hopeful. Eventually I would like to have enough drawings to translate the drawings onto a canvas. That is another area where I plan to evolve and I will write about that next time. looking back at my previous blog posts, all of the above seems too frequent theme, https://happyjacqui.wordpress.com/2015/02/10/the-fog-is-beginning-to-lift/. Need to try to be more positive! I love these drawings Jacqui. Please do more because I would live to see how this thread will develop.